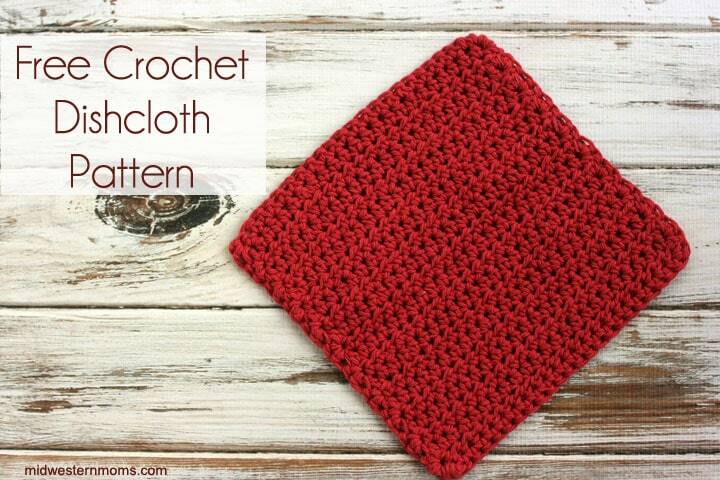 Need an easy crochet dishcloth pattern? This pattern is the very first and the most popular of my crochet dishcloth patterns I have created. 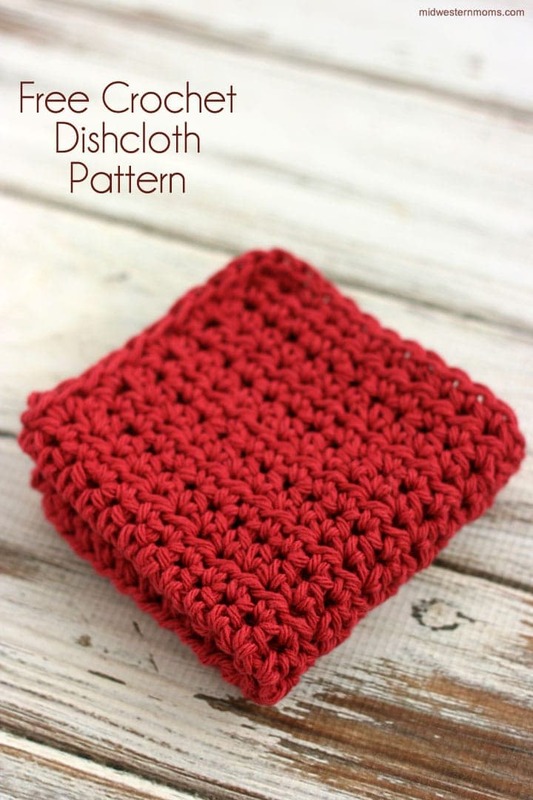 This dishcloth pattern uses the half double crochet stitch which makes it work up in a jiffy. I have started crocheting, and I love it! It all started with my sister getting married. She had nothing for her kitchen. She made the comment she didn’t have any dishcloths. I looked around and didn’t find any that I wanted to give her so I decided I would crochet some to give her. I spent hours looking through YouTube videos, and I taught myself how to crochet. I have to admit; I enjoy it. I didn’t stop with dishcloths. I went on to make my sister a set of hot pads and a scrubbie as well. I have also included a tip on how to edge your work. Edging was the was the hardest part for me to learn. Learning how to edge took many Google and YouTube searches to figure it out. When I first tried edging, my work “grew” and I had more of a bone shaped dishcloth to start with but finally figured it out. 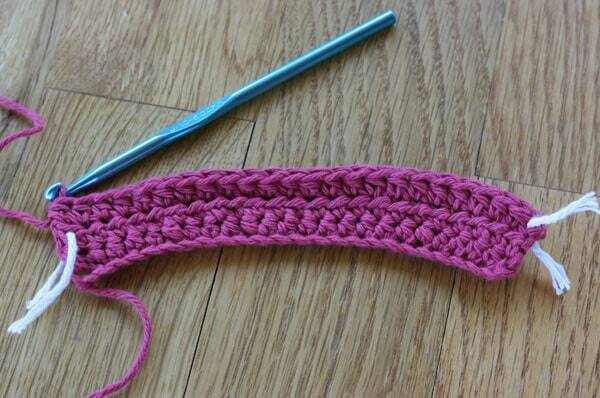 If you are like me and have no clue how to single stitch into the sides of the Half Double Crochet stitch. Basically, you put two single crochets into the area where you chain two. 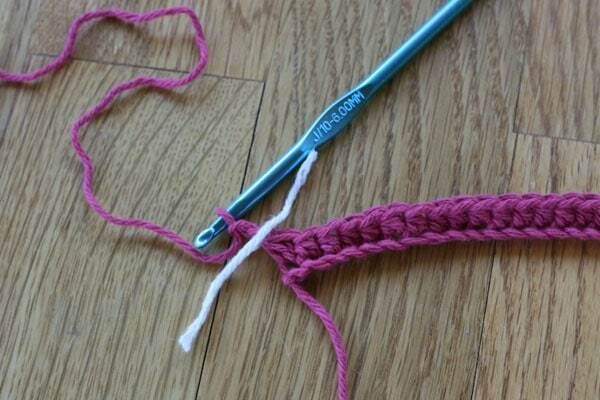 I devised a plan to help me locate where to put my single crochet edging stitches. Here is how I know where to put my stitches, I placed a small piece of yarn into the chain two space. I put one on each side, so I knew what to look for on both sides. Then you have to pull the scrap yarn out when the time comes. As you can see, your edging stitches are offset from each other. For crocheting dishcloths, I only use 100% cotton yarns. Acrylic yarn doesn’t soak up water like cotton. Plus acrylic may scratch delicate dishware and glassware. Also, for most dishcloths, you should be able to use one ball of cotton yarn. The only exception is if you use ombre cotton yarn, there is usually less yarn in an ombre ball, and you may need a second ball to complete your project. You can also purchase Sugar ‘n Cream Cotton yarn in solids and ombre from Michaels online. 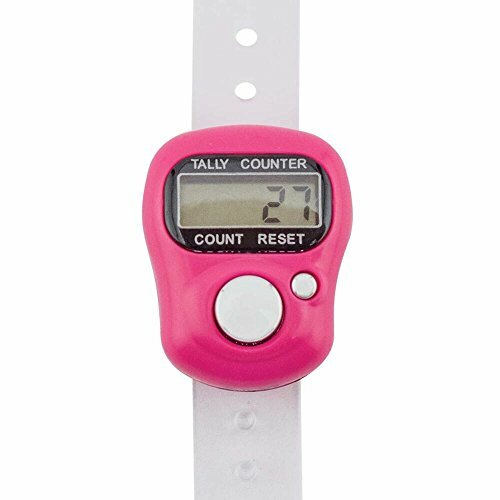 If you are in need of a row counter, I am in love with my Susan Bates Digital Row Counter! It is awesome! Row 1: CH 25; HDC into the 3rd CH from the hook; HDC into the remaining stitches of your chain; CH 2 and turn your work. Edging – CH 1 and Turn your work; SC around the dishcloth. Put 3 SC into the corners to help give the dishcloth a rounded corner. After getting all the way around, Slip Stitch and finish off. Then weave the tails into your work. Have any questions; please let me know. What other crochet patterns would you like to see? Enter your information in the form below to snag your free crochet dishcloth pattern! Once you have done this, an email will be sent to you to download the pattern. So crafty! I’ve always wanted to learn how to crochet! If you want to learn, you tube is the way to go. It looks very easy I’m going to give it a go .love the color. Got a question it says to chain 25 do you put two more on it you said if it tell you to chain 10 put two more on ( well )???????? You do not have to add more chains. What a great idea with yarn remnants. Well done! These are beautiful! I’m a novice so the idea of using a pattern is scary! I thought it was scary too at first. That is why I started off doing easy projects first. You should see the facial scrubbie I am working on. Can’t wait to post pictures. These are beautiful. Very crafty! For rows 2-20 when you say to HDC in the top stitches- is that the regular place where one would normally put the next row? Or does that mean the same as in the back loop? Thanks! In the regular place that a person would normally put their stitches. No back loops in this pattern. Thanks for stopping by Debbie! Let me know if you have any more questions. thank you for sharing! Can’t count the number of times I have been fooled by free patterns only to find there is no free pattern at all, only a web site to sell patterns! Congratulations for your integrity! I will remember your kindness and will tell my friends! You’re Welcome Anne! Make sure you come back. I am working on a new dishcloth pattern. As soon as I get a how-to video done, it will be posted. Thanks for stopping by! Have you come up with the new dish cloth pattern yet? Wonderful site. Loved that yellow yarn. Will try these dish clothes soon. Let me know how you do. Thanks! Glad you liked the pattern! Hope your friend loves them!! Hello Lisa! I do mean the regular loop. Sorry to confuse you. Glad you love it! The pattern is not printable. You should be able to print from your browser but currently I do not offer a printable. Is the ch2 at the beginning: does it count as the first hdc in that row? Or do you hdc in the same stitch as it too? I did not count the chains as the first stitch. I did the first hcd into the same stitch. I didn’t like the gap it left and that is why I did that. I am wondering if the ch2 at the start is considered stitch 1? I did not count it as a stitch. I didn’t like the gap it left. Found these on pinterest. It’s the only dish towel I have and works better than store bought one so thanks for sharing. In the process of making more right now cause could use another plus brother in law wants one as well. Cotton is better for these types of projects. Acrylic yarn will not absorb water well and they will not last like the cotton yarn. Acrylic might be ok for scrubbies since it will be more scratchy. Awesome thank you so much! When working the edging down the side of the rows do you only put 2 sc in the ch 2 sp or do you put them in other spaces as well? Thanks in advance! Pat, There is 22 stitches in a row. There is a printable version now. Before, I didn’t offer a printable version. That comment was from before the printable was offered. Love the pattern I have crochet for many years,my question is chained 25,then crocheting in the 3rd chain leaves 23 st. With the ch,2 at the ends adds 2 more st 25, should I not be putting a st in the top of the ch2, so my question is how many st should I have? Could I make a baby blanket using a soft yard with the hdc stitch? Sure you can! It may end up being a little bit smaller but you can add a few stitches to each row and add more rows too. Just depends on the size you want. I finished the double crochet dishcloth. I like it pretty good . I’m just not use to a big dishcloth. Mine measures 10 x 6 . So next time I’m thinking about making it shorter . But all& All it’s great ! Doesn’t take a lot of yarn or time . Thank. You for sharing . Hi Devon. For the life of me I can’t figure out the edging thing.. can you explain again what I do?? What part are you getting snagged on? Hello, I am a little confused on the corners? – CH 1 and Turn your work; SC around the dishcloth. Put 3 SC into the corners to help give the dishcloth a rounded corner. After getting all the way around, Slip Stitch and finish off. Then weave the tails into your work. Are you saying to put 3 SC in each corner, by cutting the yarn and stitching these corners separately? Carly, You only cut your yarn when you are completely done with the dishcloth. It just means, when you get to a corner of the dishcloth, instead of crocheting 1 SC into the stitch, crochet 3, then go back to one in each stitch till you reach the next corner.